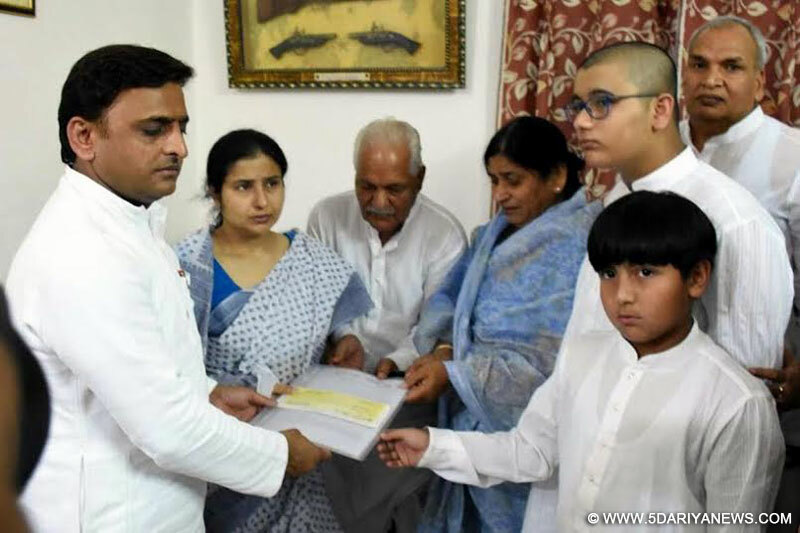 Uttar Pradesh chief minister Akhilesh Yadav at the residence of deceased SP city Mukul Dwivedi with family members. A day after the BJP raked up the Mathura violence to flay his government, Uttar Pradesh Chief Minister Akhilesh Yadav on Monday said the opposition party was homing in on such incidents since it had "no real issue" to focus on before the 2017 assembly elections.Asked about the demand for a Central Bureau of Investigation probe into the violence at Jawaharbagh here, the Chief Minister said a probe by a retired high court judge was on. "A judicial probe is going on and those found responsible will be dealt with firmly," he said.Akhilesh Yadav, who met the family members of Superintendent of Police Mukul Dwivedi who died in the violence, assured all help to the bereaved family.He again admitted to the lapses in the anti-encroachment drive in the town and claimed delay in police action was due to the fact that the administration did not want to target women, children and innocent people in the park.Jawaharbagh was occupied by thousands of squatters for about two years, till police swung into action to evict them on June 2.As many as 29 people, including two senior police officials, were killed in the violence.The squatters were led by a cult leader Ram Vriksha Singh Yadav. The Chief Minister said that poverty and unemployment were serious problems, and some people had attracted crowds to the park built on government land by promising land and food.These unsuspecting people were used as human shield even as the cult leaders made impractical demands, he said.Akhilesh Yadav also detailed the achievements of his government, saying it was working to improve the lives of the poor, women, labourers, marginal farmers and businessmen.